This is a 1940s vintage and original calendar art print by prolific American pin-up artist Gil Elvgren. 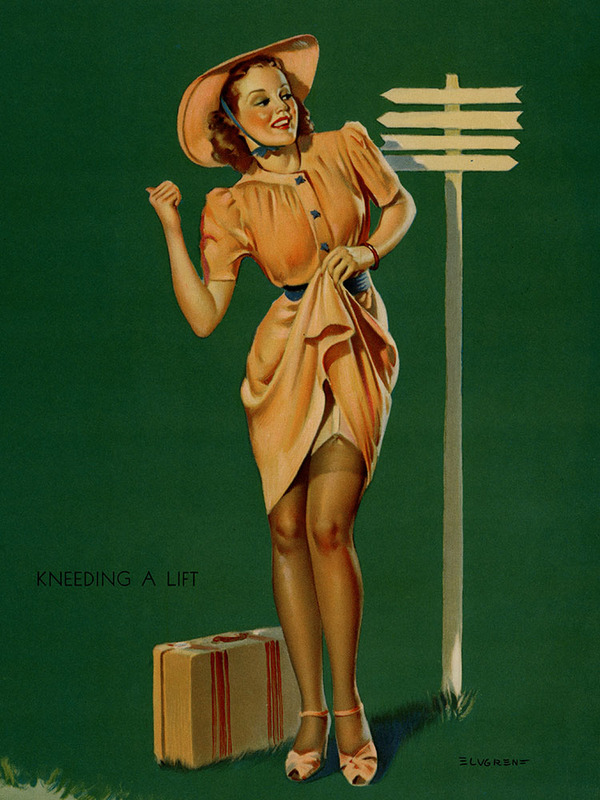 Created for the Louis F. Dow Calendar Company of St. Paul, Minnesota, this vibrant lithograph, titled "Kneeding A Lift", features a beautiful young brunette in dress and sun hat seen daringly lifting the hem of her skirt to show off stocking-clad legs while hitchhiking for a ride out of town. A beautiful classic pin-up image that will frame and display very nicely. CONDITION: Fine condition with very minimal storage wear. Please use the included images as a conditional guide. Measures 7 1/2" x 9 1/2"